A fairly straightforward, enjoyable IoS reprint to ease us towards the end of the week. The SW corner needed a little more thought than the rest, though my LOI was 25ac elsewhere in the grid. Not because I couldn’t work out the cryptic bit, but because I was convinced it must be wrong based on the definition. The consensus over on the other side was that this was tough for a Sunday, so your mileage may vary. COD? 16d – “Healthy drink about to be consumed by chap close to poolside area (5,3)”. Well, even by Dac’s high standards that was good, with a rare (first even?) mini-theme in a couple of the clues. A few entries that were new to me, but the always fair, clear cryptic parts left no doubt as to the correct answer. Another how-to guide for would-be setters. On the easy side for a Wednesday, but no less enjoyable for it. COD? 20ac – “Woman asking for opposite of 11?”. Which I’m presuming won’t have anything to do with computers, which is a pity because that’s a speciality of mine. As are Jigsaw puzzles, it appears. Ok, this is only half a jigsaw, but the setter has still neglected to put any numbers by the across clues. So I did so myself, because, well, it turned out to be a right pain trying to do otherwise, especially with that great big unclued entry in the middle of the grid that I kept forgetting to take into account. But anyway, the preamble. Across clues are normal, in conventional order. Hurrah. Down clues are alphabetical, 12 of them need a letter removed that we lob in the centre row in the appropriate column. Remaining down answers to be entered where they will fit. We’ve been at this kind of thing for weeks now, so it should be a doddle, shouldn’t it? At the close we’re to complete the centre row, and find a poem that describes how those down clues were entered. Head ready to explode, onwards. So this shouldn’t be an issue. Get a load of those across answers in. Check. Get some of the downs, and see where they’ll fit. Except that they don’t. And I mean, really don’t. 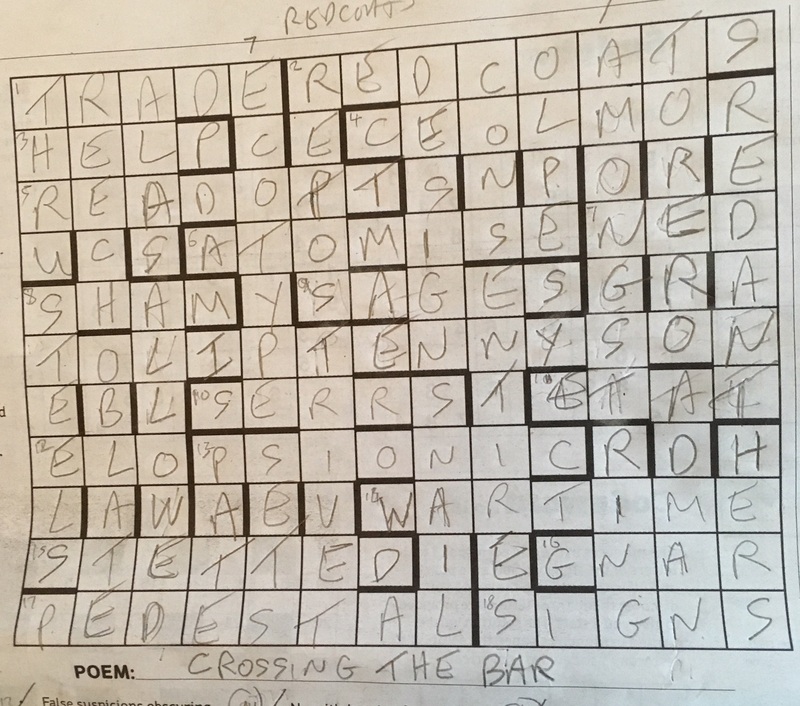 At least one clue that is too long for any of the barred entries, and one that is too short. Help. And that, really, was the whole of Saturday afternoon. Staring at a grid, at the answers, and trying to work out what we were supposed to do with those downs. Take out a common letter? There don’t appear to be any. Something else? I don’t have any ideas about something elses. Help, again. To Saturday evening. A lot more staring. A couple of clues solved. The realisation that if we ignore those bars, ECO and TYPESET will fit into column 5, forming ECOTYPE and SET with the bar splitting them. And that seems to be working out with the answers I’ve got. In the centre row a sort of name forming, TEN??S??. Yes, I should have spotted who that was sooner. But by close of play Saturday I’m good for nothing. Fast forward to Sunday evening. The fact that the down clues are in alphabetical order comes to the rescue with the big blank spaces I’ve got to the left and the right of the grid. Scrub out some answers that must be wrong. Rethink some others. What have we got? There may have been some glum faces in crosswordland this morning on account of all those interlinked clues, but I do hope nobody was too badly put off. Punk is just about the best in the business when it comes to this particular kind of gimmick (honourable mention for Scorpion, mind you), and this puzzle is right out of his top drawer. All the usual ingredients are there: wit, playfulness, bathos, and a smidgeon of mild ribaldry to keep the primly disapproving sorts happy. “Extraordinary game half finished, sailor turned over first (3-7)”. Nearly all sweetness and light in the comments on RatkojaRiku’s excellent blog at Fifteensquared when the puzzle first appeared in July 2013. The curious enumeration of 24/2 remains despite Eimi’s comment: I am still scratching my head about that so if anybody has an explanation please don’t be backward in coming forward. A pretty straightforward puzzle from the Don to start the week. The York street was new to me, but fairly clued so no complaints. Last in was 15d which I also didn’t know, and that I needed to check to make sure it wasn’t BANTAR, or something else along those lines. Belated congratulations to Mr and Mrs Quixote. After a couple of stiff challenges, it’s refreshing to be reminded of last Saturday’s puzzle, which was, relatively speaking, a breeze. Maybe Phi ratcheted the difficulty level down a little for the benefit if non-French speakers. Some may have objected to all that ‘Franglais’ (the French words chosen all had a second, English meaning), but then he did write ‘Pardon my French’ across the middle of the grid – that cringe-worthy catchphrase of Pardonia. 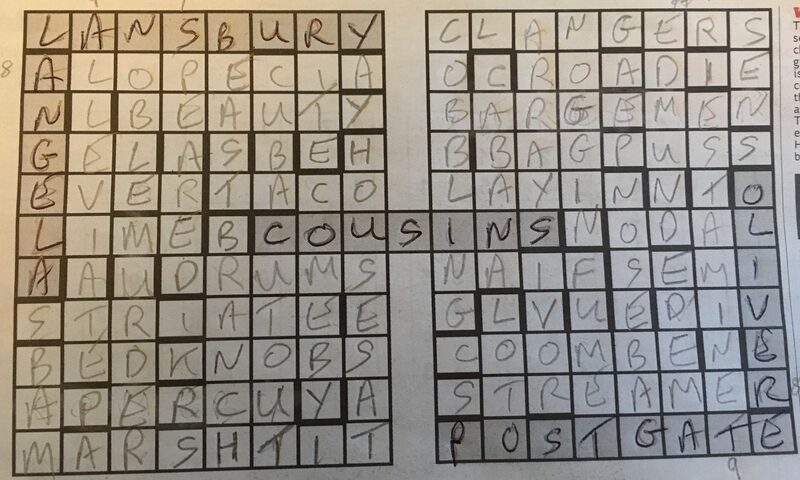 I’ve said before that I often start by looking for anagrams – the 4 long clues were all well-advertised as such, so the grid looked half full in a jiffy, and the rest all followed as near write-ins – just the Bogeyman at 11a causing pause for thought at the end. Da Ponte at 17d was new to me, but the wordplay was super-clear. So all said and done an enjoyable and novel challenge, for which the full blog from 2013 is here. I often find Tees to be on the tricky side, and today’s puzzle was certainly that. I made swift progress at the start with a few of the longer clues going straight in. Finishing, though, was another matter, with a couple of unknowns dotted round the grid (and crossed perhaps a little unfairly at 18d and 25ac), and some tricky wordplay. Martial Arts instructors, anyone? It’s been a while since I watched the Karate Kid. This was a Thursday Independent reprint, however, and not quite as unyielding as they can sometimes be. Enjoyment value overall pretty high, though with a little frustration at the close. COD? With lots of invention on show, and much to admire, 6ac – “Constant smoker worried about gas inhaled (4)”. I made hard work of today’s offering, lobbing in ONE MAN for 1d, which meant I was looking for a particularly obscure monk at 11ac. And, oh, NEEDLESS anyone at 4ac? Oh well, I got there in the end, and still in a pretty fast time for the i. Solving on a computer you can get away with this sort of thing, on paper it all begins to get rather messy. There’s some debate about one or two clues over on the other side, but TBH I didn’t spot anything difficult / controversial while solving. Perhaps I just wasn’t paying enough attention. COD? With lots to like as always, I’m nominating 10d – “Points put by Conservative fearing further presentation of bill (6,7)”. Perhaps Nimrod thought we’d got off lightly the other week, because today look it’s another jigsaw, with not one but two grids to contend with. Such fun. A few unclued entries, eight thematic clues without definitions. No doubt it will all become clear at the close. So to the clues, and thankfully with all that cold solving they’re fairly forgiving of my solving abilities. Especially Saturday afternoon when I’m not usually on top form. Just a pity that we don’t know what to do with any of them. I’ve noted where the 9 and 8 length clues go in both grids, in the hope they might provide a definite answer. With what I’ve got they don’t of course. Let’s chuck ALLEVIATE in the left hand grid, with ALOPECIA crossing it, and see how we get on. That gives what may or may not be crossing letters, but doesn’t help that much. The clues are in alphabetical order of the answers, which does, a little. Those clues without definitions then. I’ve got one – IVOR. A list of setters then? No, that’s Ifor. Doh. But what about “People with common ancestor, German saint”, CLAN GER S. Surely not the Clangers? And Ivor the Engine? Oliver Postgate, the co-creator of both (yes, I had to Google that), will fit in those unclued entries in the right hand grid. Let’s chuck him in. And that side rapidly begins to fill, partly based on the certainty that BAGPUSS is going to be in there somewhere, and look there’s NOGGIN the Nog, which I vaguely remember. So the obvious answer is that the left hand grid will have something to do with Peter Firmin, except his name won’t fit into the unclued entries. So I’ve got no idea. But I do have a much smaller list of clues to work with, so let’s go. And look, there’s another thematic clue. BEDKNOBS. And broomsticks? There’s another one, MURDER She Wrote. Got to be Angela Lansbury then. Chuck her name in the unclued entries. Two more thematic entries – BEAUTY and the BEAST. The last unclued entry linking the grids? There’s not a lot that will match COU?INS, and lo and behold they were. Who knew? eXtent of course. Thanks then for a fun outing that wasn’t as scary as it first looked, with something new learnt along the way. Jigsaws? Pah, no problem.